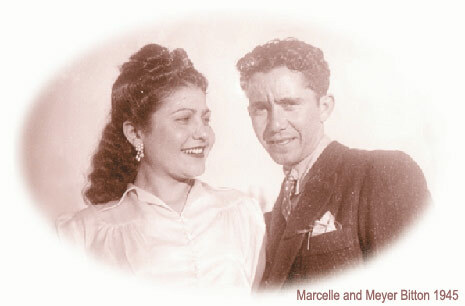 Marcelle and Meyer Bitton, 1945. “PARIS BLUES ” is the musical story - sometimes joyful, often melancholy, and always hopeful - of a beautiful city in a time of war and liberation.  It's the evocation of an era that produced some of our most gifted composers and performers, Parisians by birth and by adoption who sustained and redefined their city's sense of romance and excitement in the years before, during, and immediately after World War II. Like the people whose work this CD celebrates, I too have left my heart in Paris. I've traveled from America to France, and on to Spain and Portugal, retracing the lives of these artists who, along with Americans Sydney Bechet and Billie Holiday, gave Paris its special sound in the years 1937 to 1947. I wanted to lose myself in the places they once walked, taste the foods they tasted, listen to the music they inspired, and talk to the people in the streets. For generations, composers, writers, artists of every temperament and from virtually every country in the world have been irresistibly drawn to the City of Light, where they could share and refine their superb talents in an atmosphere of acceptance and celebration. And even after the misery of the Occupation, the Mars Club in Paris was one of the many nightclubs that featured African American musicians, who were instrumental in resurrecting Paris jazz after its glory days in Montmartre. 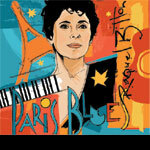 PARIS BLUES ranges from the music of the American Sydney Bechet (Petite Fleur); Belgian Gypsy guitarist Django Reinhardt (Nuages); Billie Holiday (Je suis folle de t'aimer); the queen of Portuguese “fado” Amalia Rodrigues (Paris s'eveille la nuit); Argentinean Tangoist Tino Rossi (Ecris moi); French crooner Jean Sablon, who teamed with Django and violinist Stephan Grappelli (Il ne faut pas briser un reve); band singer Lucienne Delyle (Jai chante sur ma peine, Pour lui, malgre tes serments); and sultry Jazz chanteuses Leo Marjane (Je suis seule ce soir) and Suzy Solidor (Escale). I have retained the verses, so seldom sung any more, because it is in verses that you find the heartbeat of each song. Without them, the songs don't really exist. I've spent my life passionately in love with this music. This was the music I heard growing up, the songs my parents whistled, hummed, danced to, the poetry that my father - himself so much a poet at heart - opened up for me. Together, we spent more than five years going through his record collection - and more often than not, my parents would forget I was in the room as they reminisced about the first time they'd heard a particular song. And once, in the autumn of their lives, when Tino Rossi's Ecris moi came through the pops and scratches of the ancient phonograph, their once-again youthful eyes locked in one long gaze and they stood up to dance the tango. Raquel Bitton's "Boleros" is the perfect vehicle to whisk you away to a foreign destination where life is dreamy and awash with amor. Her voice and music transcend time and hit that haunting quality of lovers from long ago. (Think Edith Piaf) Pop open a bottle of wine with a label you don't understand, turn down the lights, turn up the volume and let you and your love be transported to the Continent for a night of romance. In these tough times, it's the perfect European stay-cation!